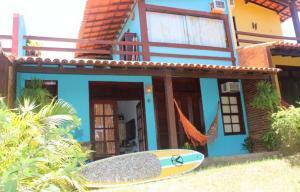 Click on the photo and see all the photos of Casa Em Buzios. Situated within the Geriba district in Búzios, Casa Em Buzios has air conditioning, a terrace, and mountain views. Featuring lake views, this holiday home also features free WiFi. This holiday home is fitted with 2 bedrooms, a flat-screen TV, and a kitchen. The holiday home also provides a bathroom with a shower. The holiday home offers a sauna. If you would like to discover the area, snorkelling, diving and fishing are possible in the surroundings. Armação Beach is 3.5 km from Casa Em Buzios, while Geriba Lagoon is an 8-minute walk from the property.